Adhesive backed fabric. 2 24" x 48" panels, total area coverage of 48" x 48". Please note that this item will be drop shipped and has a two week ship time. Inspired by Keith Haring's vivacious drawings on the public walls of New York, these fabric wall tiles bring movement to any wall in your home. 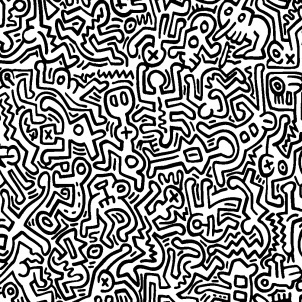 This pattern is similar to the one scrawled on the walls of Haring's Pop Shop in the 1980's. 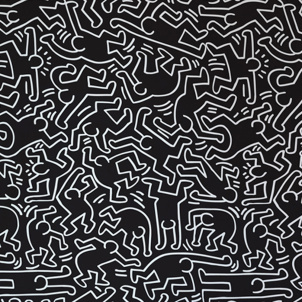 Keith Haring's work is featured in the Whitney Museum's 2017 exhibition Fast Forward: Painting from the 1980's. These tiles are self-adhesive and easy to install, reposition, and move around. Blik wall tiles are made from an eco-friendly fabric based material that adheres to most flat surfaces. Available in black/white and blue/red.